Breathtaking views, classy beach decor from around the world and Jacuzzi tub with a view of the Gulf are just a few of the things "So-fish-ticated" has to offer. This beautiful 3 bed, 3 bath condo comfortably sleeps 7. The first guest room features a queen bed while the second one has a twin over double bunk bed. The master bedroom has a king bed, whirlpool tub, and breathtaking views from the sliding doors to the balcony, and Jacuzzi. You can cook your catch of the day in the upgraded kitchen, complete with granite counter tops. Enjoy your dinner in the dining area which seats up to 10. 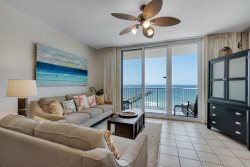 You will feel right at home with our cozy coastal decor or on the balcony lounging in a lounge chair or taking in the view from the raised lifeguard style chairs also on the balcony. If you are looking forward to the sea breeze, sunshine and memories to last a lifetime, this is the place for you! Stay by the sea in style. This unit requires a Saturday to Saturday during peak seasons! Beautiful home, beautiful beach, beautiful vacation!